People who have known me for some time know that my weight was a longtime struggle for me. As someone genetically predispositioned to easily gain and have trouble losing weight, I have paid my dues with decades of wild weight fluctuations and dietary acrobatics. They also know that all this changed almost twenty years ago when I dove into synchronizing the three pillars that form the core of my success. In truth, in the first photo in the photo history above, dated 1998, I was already down about fifteen pounds from my high weight of 189.5. When I meet people today…. Yet often when I meet people today, they tell me they find it hard to believe that I ever had a weight problem. Once we engage in conversation, or they read the My Journey chapter from The Plant-Based Journey, or more about my story in Fit Quickies, or in the article My McDougall Diet Failure, we form an instant connection. 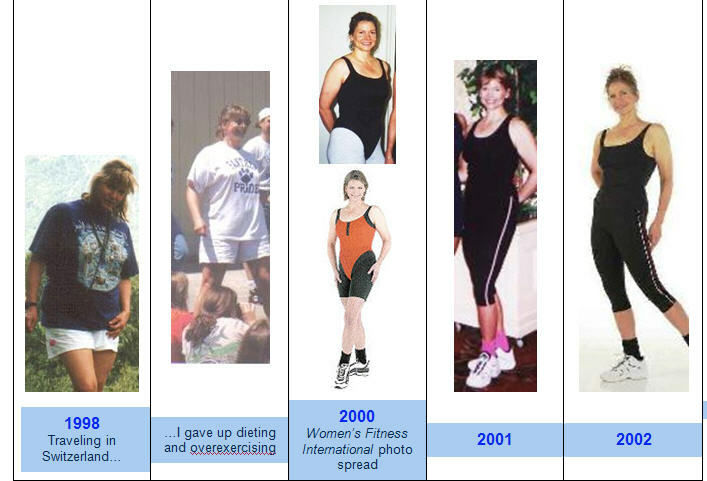 Another way to connect personal weight-challenge histories has been through the photo history (above) that has been a longtime reference point on this website. Yet Jill’s email today (see further down the article) pointed out to me that this photo history is not easily found in this latest incarnation of my website. As a matter of fact, when I went to find a link to the photos to send Jill, I couldn’t find one and simply attached the images to my email reply. That is what inspired me to republish these photos today. And to sit down and talk with you about it. Jill’s letter is the third of three events that synchronized this week that have given rise to our conversation here today. The common theme of these events – sustainability when it comes to weight loss – hit me over the head like a ton of bricks, though it took me a few days to see it. The ten year photo history you see above adds the visual to the big point that needs to be made. First, this week concluded a series of sessions with a Fast Start client, Victoria (not her real name). Victoria could not have responded in a way more pleasing and satisfying to me. This was more valuable than if she had said “losing XYZ pounds”. For more important than rapid weight loss is building the skills needed to eventually do this in a way that is sustainable for the rest of our healthy happy life. Second, I was invited by the Green Is Good radio show to be a guest on their program this week. Their theme is sustainability, and they were eager to speak to me about The Plant-Based Journey and how a plant-based diet is so important for sustainability when it comes to feeding people on our increasingly stressed planetary resources of water, land, and air. Of course, it was the perfect opportunity for me, during the show recording, to point out the connection between the usual idea of sustainability (environmental) and personal sustainability when it comes to diet and lifestyle. As you can imagine, I was one happy camper about that. Finally, the sustainability theme gelled with this email just in from Jill. Jill had just purchased the video downloads of Fit Quickies and had a question for me. Also – do you still have a link to your 11+ photo history of your weight loss journey? How long did it take you to lose 50 lbs on the plant based diet? I am looking forward to the consistent/sustainable loss…saying goodbye to yo-yo dieting and keeping multiple sizes in my wardrobe. My story is very similar to yours. I even taught aerobics in college and afterwads while struggling to maintain a consistent weight. I think just seeing the gradual…sustainable…life altering transformation (not a crash diet…but a lifestyle change that sticks) is what inspires me about the photo history. It is really hard to believe that the way you look today isn’t how you’ve already looked…so the transformation is inspiring because it says “she understands”….she knows all about struggling…she’s not always been trim. Anyone can lose ten, fifteen, twenty or more pounds. I did. Over and over again. For decades, the short-term win took precedence over the long-term success. Sustainability of weight loss is only possible with sustainability of lifestyle that leads to weight loss and weight management. It was then and only then that I gave up the fantasy of quick weight loss, magic bullet diets, and what I came to call “the spoiled brat syndrome” of being able to eat whatever I wanted whenever I wanted (we’re talking bags of Mn-M’s here, not whole grain bread) and still have the health and slender physique that I craved. I always knew that there must be some way that I could eat, move, and simply be that would let me become lithe and comfortably slim. A path that was also in harmony with my highest ideals of sustainability for the planet and compassion for our fellow critters. The answer I found in the sustainability of a whole food plant-based diet, simple physical activity, and attention to mindfulness and getting some degree of mastery over our habits of thinking. It is these together that have made the difference for me. And for the growing list of sustainable-svelte seekers who come to me for help. And it is that which truly sets the Journey style apart from other approaches. Physical, mental, and emotional sustainability. Jill, a big thank you to you for your email today asking about the photo history. In all honesty, I had forgotten about what a tremendous impact these images have had upon people. I think this is because, for me, this all seems like so long ago – and the rhythm and practices that have proven successful and sustainable to me for so long have become such a part of me, that though the pain of remembrance of the struggle so many years back now is easily recalled, it isn’t driving my daily consciousness any more. And that is good news, isn’t it? P.S. Your thoughts about sustainability and weight? Please share your thoughts below. Hey Marcy, we’re all in this together! What an inspiration! Do you have a book out or a weight loss plan I could look at? Thanks so much! Shellagh, so glad you are inspired! Let me know how else I can help. And be sure to download the free exerpt from Journy, PLUS note the pre-order bonus gifts on the Plant-Based Journey page – it includes a free excerpt from the book pre-publication – and it’s a chunk of content from the Weight Loss Connection chapter – made to order! I also searched for years to find a way of eating that would sustain me in a delicious and healthy manner. I discovered McDougall 4 years ago, lost the ten pounds I’d been trying to lose for years and stopped fretting over every morsel I put in my body. So I’m slim now but the muscle tone is lacking. Is it possible to regain muscle in the 60s? I have always exercised and am lifting weights. Just wondering if there is a doable regimen to regain muscle tone at this age. Mary, it’s great to hear about your weight loss and weight management success, thanks for sharing this. This goes into amount of weight used, so not specific to your question about age, but has bearing nonetheless. The doable regimen is one that challenges your muscles sufficiently without compromising your orthopedically. If you are getting stronger, you are building muscle – and if not, more challenge is all that is needed! Your website is great! I’m an ex-crossfitter. I’m a meat eater. I’m overweight. (I didn’t lose a pound despite 7 exhausting crossfit workouts a week! I ended up exhausted and a few pounds heavier than when I started!!! (5’6 and weigh 176). Funny thing is, I had been a vegetarian from “toddlerhood” until probably age 28-29. Now I’m 37 and can’t lose more than 10 pounds without getting stuck and slowly regaining it over a few months. I just watched the Engine2 show on Netflix. Rip made a breakfast cereal that I imagine would put 5 pounds on me within a week’s time! And he uses avocado as a salad dressing, hummus, lasagna noodles with sweet potatoes! A carb coma! I really need to lose about 30 pounds but I’m really scared to eat all that. I am a special education teacher with 3 kids and a husband in college. I use my Total Gym every other day and ride bikes with the family on the weekend, but other than that, I’m too exhausted from my job to do anything else, so that’s why I’m afraid to eat all those carbs! Did you eat cereal and carbs when you were trying to slim down? I’m tired of being sick and tired. Too tired to enjoy life, and I’m way too young for that. Too tired to cook healthy meals for my family. By the way, I didn’t weigh 176 pounds as a vegetarian. I weighed 150, but that was before 3 kids. Thanks for your patience in my getting back to you. Travel for 3 weeks off the grid has given me a lot to catch up with! A couple of things. First, remember that Rip is a male active athlete and they seem to always be able to shovel down bucketfulls more of everything than we females. Even so, carbophobia runs rampant and it can be a hurdle to overcome. Yes, I ate whole grains and whole grain bread every day of my 50 pound weight loss, accompanied with lots of beans and vegetables and a few nuts and seeds, too. I tell the details in The Plant-Based Journey, a copy of which I recommend you pick up so that you can get some support in appropriate amounts as well as how someone who easily gains (that would be me) their entire life has pulled it together. It sounds like you have a good consistent pattern of physical activity. The food clinches the difference, as important as exercise is for your body and for what it does for your brain, you need all three: the food, the fitness, and the frame of mind. You can download the first 40 pages of Journey for free, did you know? Hope this helps, my heart goes out to your struggle as it was my lot in life for so long!